Disclaimer! Check your local regulations to be sure this type of trap is legal to use in your area! 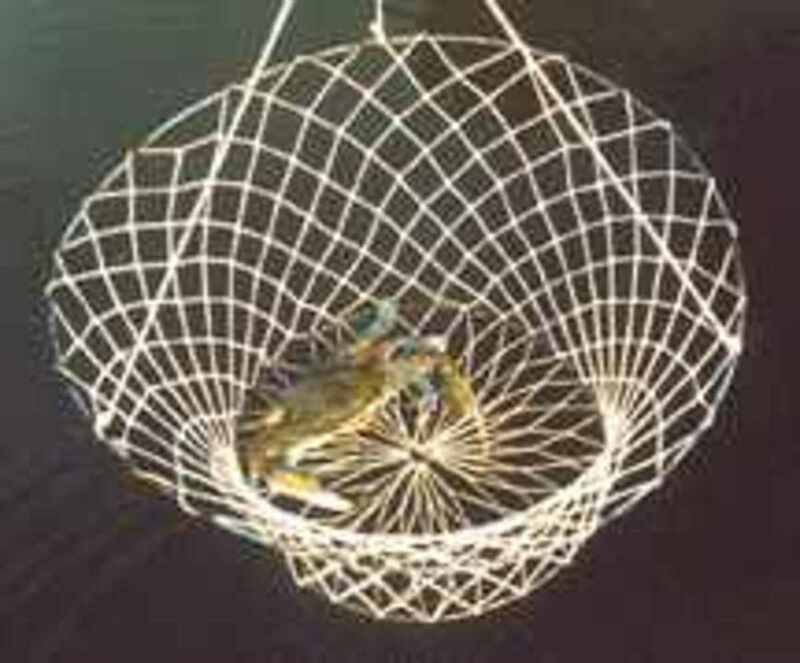 I was looking for a lightweight, cheap, non-corroding crab trap design. I needed it to be cheap because there were several locations I wanted to trap. 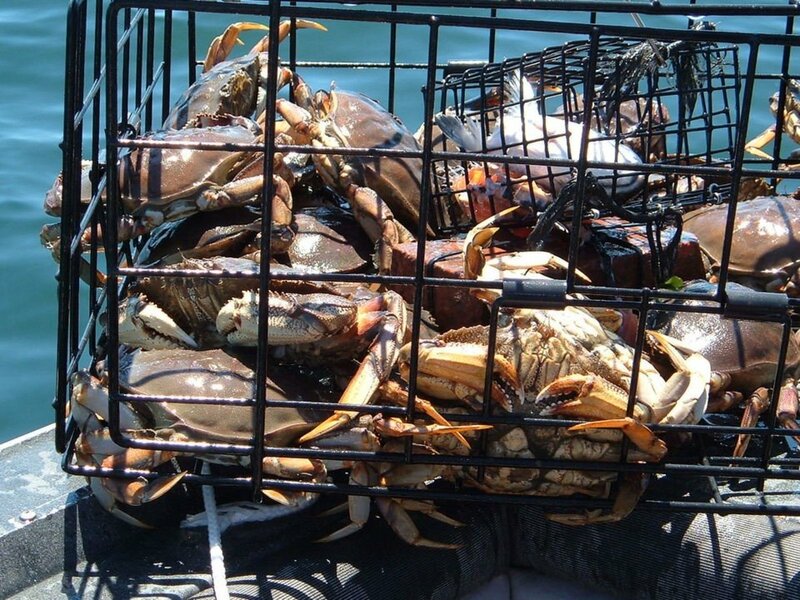 The problem I found with crab traps is that DIY designs are far and few between. The ones I did find were not what I was looking for. So I came up with this little number. It is simple, cheap and light-weight. There are only a few steps to building one. You can build three or four in an afternoon. Materials are readily available at any big chain hardware store. ½" PVC. How much depends on how large you want your trap, they come in 10' sections. First, take the PVC pipe and elbows and build a rectangular box. Drill holes for the eye bolts along the top pipes. Drill drain holes in the corners, and along the sides. Wrap the sides, top and bottom with chicken wire. Secure with the galvanized wire by twisting. Cover one end with a square of chicken wire. Hinge it from the top with zip ties. 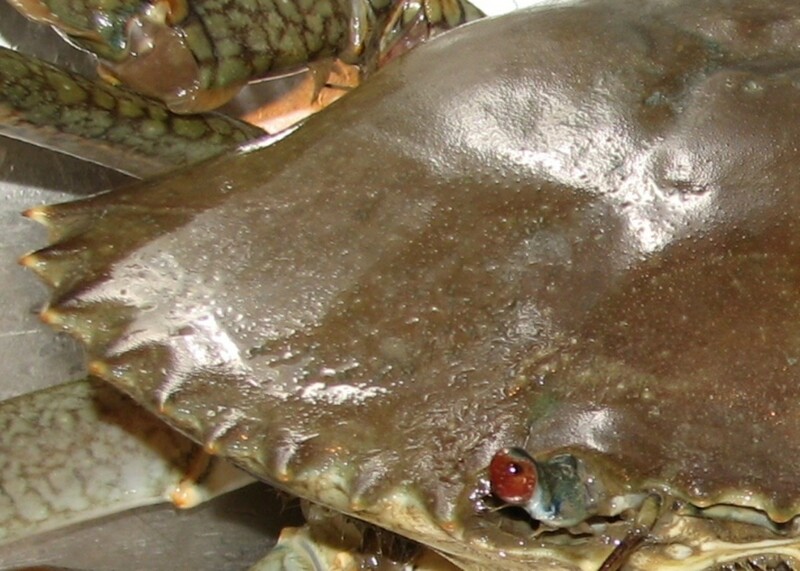 You'll secure the bottom with another zip tie, string, or whatever after the bait is loaded. Make a funnel out of chicken wire for the other end. There is going to be some bending and shaping involved to make it fit. 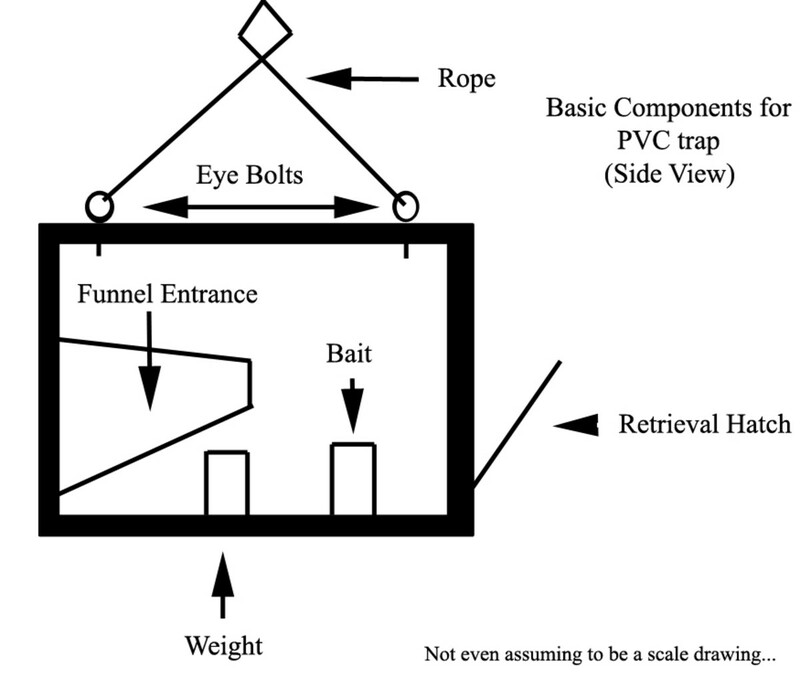 The funnel entrance should be at the bottom of the trap. The exit should be in the middle of the trap. Make sure your holes are large enough to let the prey in. Attach this with the galvanized wire. Take two lengths of rope make a loop in the middle and splice loops on all ends (four loops) inside the eyebolts. Make sure the lengths of rope are very close to the same length. Take remaining rope and splice a loop on the end. Attach the carabineer to the loop. This will attach to both middle loops of the ropes attached to the eyebolts. Very simple. Put some bait in the mesh bag. Zip-tie it to the bottom of the trap. Attach your rope and throw it in the water. Secure your rope on something, our use a bouy. Wait a few hours and pull it up. 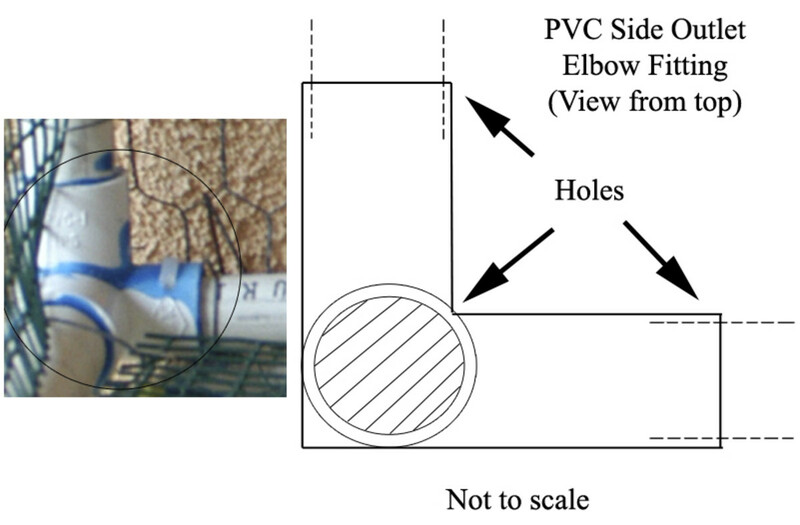 The use of galvanized wire to secure the chicken wire it a self destruct mechanism. 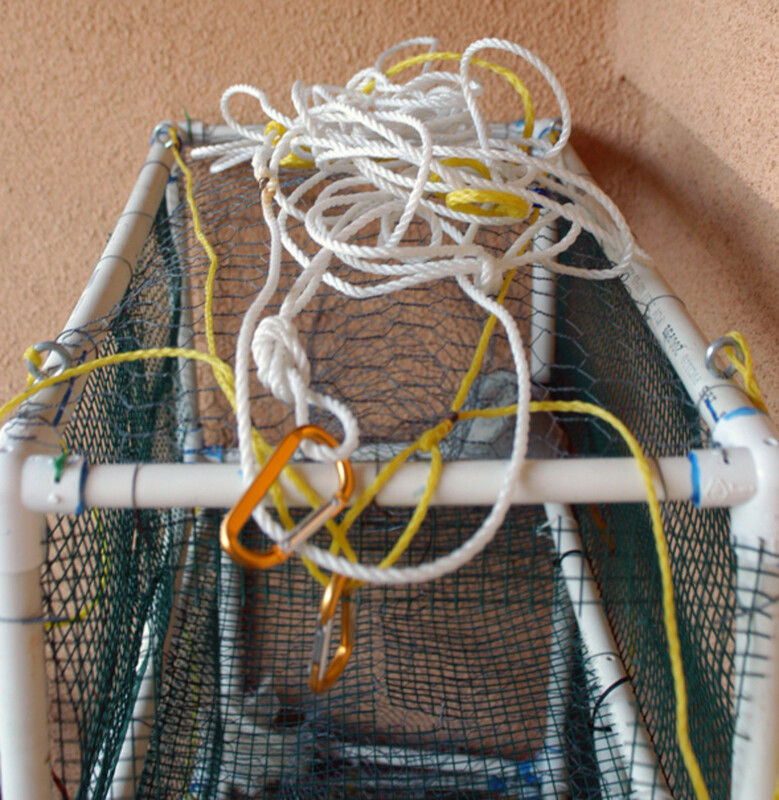 If the trap gets lost in the water, the wire will corrode away and the trap will just be a PVC frame. 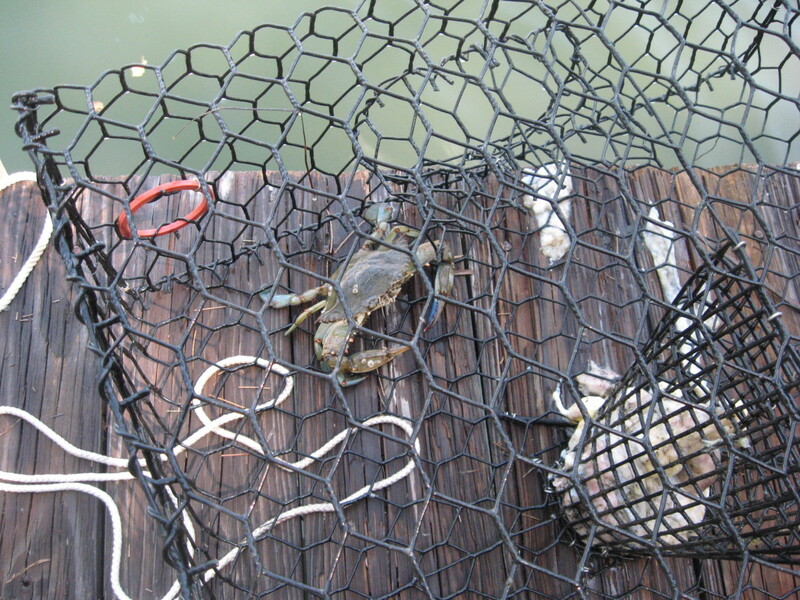 Though it may be annoying for a fisherman to catch a PVC frame, at least no animals will continue to get trapped by it. If you experience pretty rough tides you may want to attach some weight as well. I make my own with concrete and an eyebolt. 5lb barbell wieghts work good too. Also, because the materials corrode in saltwater, make sure you do a fresh water rinse after ever use. Looks great and simple to make, will make one. What type of bait is used fo lobsters? How come this can't be used in California? Interesting set up, was cool to read. Thankyou for the excellent lobster trap plans. From the photos of the traps it appears they are enclosed in a 1/4 inch black plastic mesh webbing in addition to the chicken wire. No mention of it in the text. Is this an important component? Wow, I never thought this would be such a popular posting! Thanks everyone. I'd love to hear your stories of how this worked for you. Ian - Sorry I didn't get too specific because the dimensions are really up to you and your conditions on how you want to build this. It's all squares and rectangles, so make it as big or small as you want to. Ian im making one 30x30x60. tallxwidexLong, and looks ok. write me at the_wu_jr87@hotmail.com ill send some photos. looks great but no dimensions to follow! 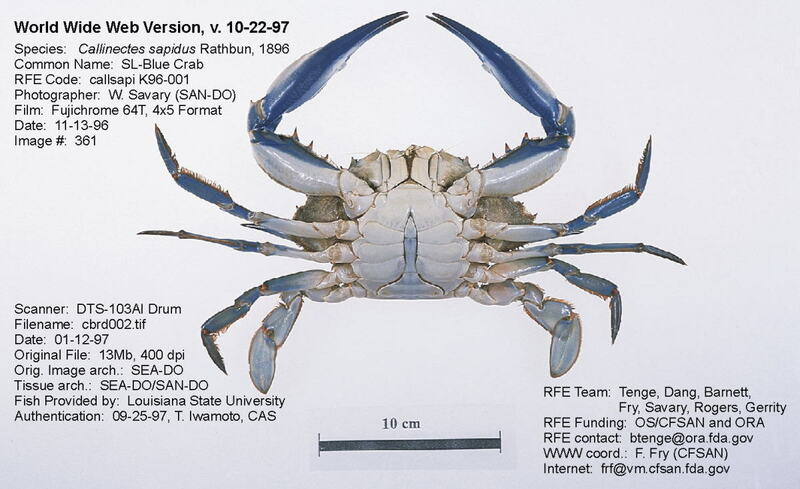 Its an awesome design but unfortunately cant be used down here in California for crabs and lobster but still its great for crayfish i bet. cool traps! 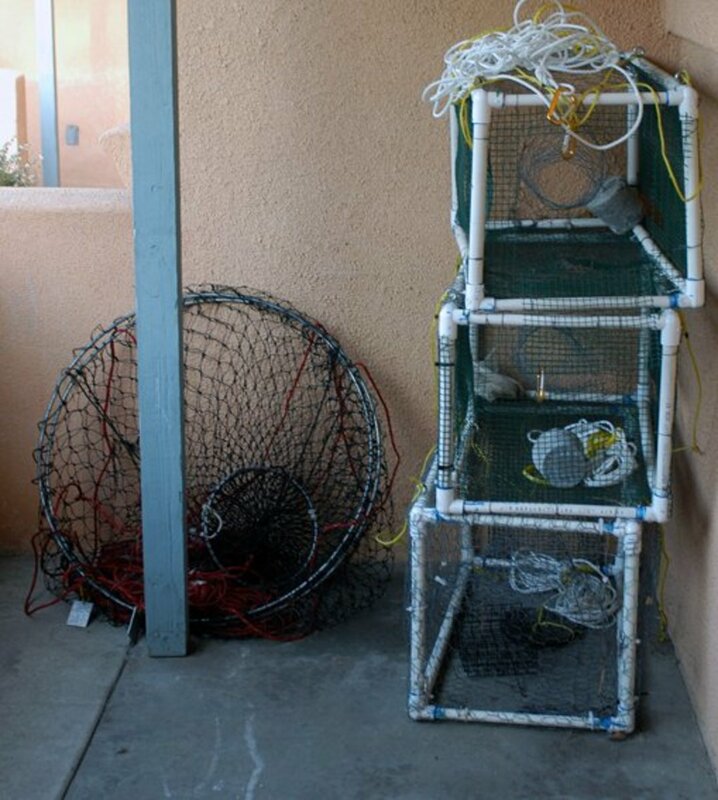 I have built them from chicken wire before but I never used the PVC, I have seen a lot of traps like yours being sold for up fifty bucks! Thanks for the info! Take care and have a happy life.